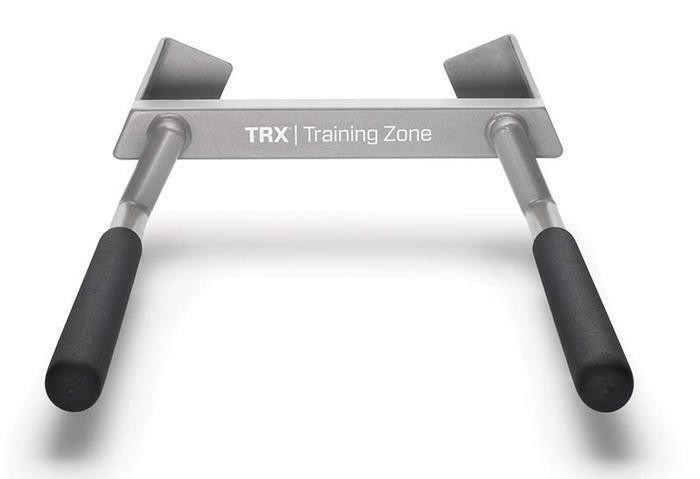 Fitness Anywhere of San Francisco, Calif., is recalling about 2,700 TRX dip and hammer bars. The welds on the bars can crack or break and cause the user to fall, posing a risk of injury. The company has received 33 reports of welds breaking, including one report of a minor injury. This recall involves TRX dip bars and hammer bars used with TRX S-Frames and Elevated Frames which are used to support TRX exercise equipment. The TRX dip bar for an S-Frame consists of two handles about 18" apart at the base affixed to a 49" bar that attaches to the S-Frame. The TRX dip bar for an Elevated Frame consists of two handles about 18" apart at the base affixed to a 58" bar that attaches to the Elevated Frame. They are used for performing dips and other related exercises. The TRX hammer bar consists of two handles about 16" apart affixed to a 17" bar that attaches near the top of the S-Frame or Elevated Frame and is used for performing pull ups and other related exercises. The bars, manufactured in the U.S and China, were sold at Fitness Anywhere and authorized commercial distributors nationwide from June 2011 to May 2013 for about $500. Consumers should immediately stop using the recalled dip bars and hammer bars and contact Fitness Anywhere for a replacement. Fitness Anywhere has notified all known purchasers. Consumers may contact Fitness Anywhere toll-free at (888) 221-7417 between 9 a.m. and 5 p.m. PT Monday through Friday or by email at customercare@trxtraining.com.